This is what I have been waiting for: BRUNCH at Seersucker. The one meal I can drag a couple of hungry children to and not feel too self conscious. Thank you Seersucker for getting this going, as pledged when you opened back in May. 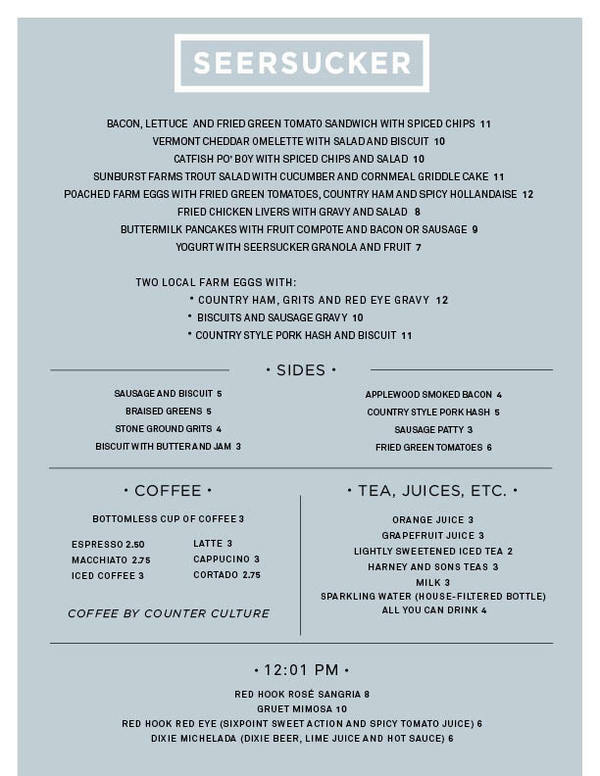 Fried chicken livers, a catfish po’ boy, biscuits and grits; these I can get behind on a sunny Sunday morning. And I am curious, if a little nervous, to try the Dixie Michelada, Dixie beer mixed with lime juice and hot sauce – sounds like a hangover cure if ever there were one. 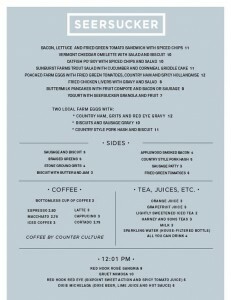 Brunch service begins tomorrow, Sunday, July 18, from 11am to 2pm. Seersucker is at 329 Smith Street, near President Street in Carroll Gardens: Phone: 718.422.0444. MMM. Fried chicken livers… just as in the shtatle. I think it will be worth making the 2 pm deadline. The beer… I don’t think I am that interested either. Hope they have the regular bloody Mary and Mimosas. Btw, they were featured in the last NY Mag. for the best cheap eats and so was the Collective for something completely different.